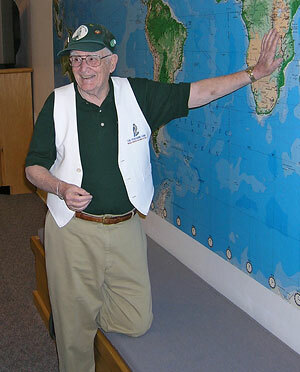 The Peregrine Fund lost a long-time volunteer, friend, and life-long supporter - Bert Cleaveland. While many knew Bert as an avid birder and devoted volunteer at the Interpretive Center, his dedication spans more than two decades to include national and international work. Until his retirement in 1985, Bert worked as a forester for Boise Cascade for more than 35 years. In the early 1980s when The Peregrine Fund was looking for release sites for Peregrine falcons in Idaho, Bert was assigned to help look on Boise Cascade property. Bert told about his early years with The Peregrine Fund and what got him hooked: "I'll never forget that Gyrfalcon Bill [Burnham] brought with him when he first came [to Boise Cascade]. I had been an avid birder since age 12 and that was a real treat for me... I never actually thought I'd ever get to see a white Gyrfalcon in my lifetime." Upon retirement, Bert began volunteering at the World Center for Birds of Prey. From guiding tours for the general public and schools to organizing slides and manning booths at events, he did it all. By 1987 Bert had made such an impression that he was asked to participate in the Maya Project in Guatemala and utilize his forestry background to survey vegetation. He spent two field seasons conducting habitat surveys in the areas where raptor surveys were being done. There's no doubt that Bert's dedication to the Education Program and the Interpretive Center are unmatched by any volunteer. Bert donated more than 6,500 hours to the organization over the years. Whether it was young school children or adults with no interest in birds of prey, Bert always connected with his audience. His information and descriptions were precise and he had a way of making people laugh. He was always good for a nice Hawaiian shirt at a volunteer party, a big smile on his face, and stories to entertain all ages. If the walls of the Interpretive Center could talk, there's no telling how many of Bert's stories would be played back. One thing is for certain - Bert's enthusiasm will be shared by all of us that he touched over the years.